The tree is up, the lights are bright, and up above the fire place, the stockings are hung. Hello again gorgeous! We're back on the Blowtique blog to talk about what you can stuff your stockings with and how to make it a sweet surprise no one could ever forget! Stockings to me are that cherry on top to a perfect Christmas morning, but this year, let's skip the candy and add an extra special touch to those Christmas stockings! Earrings are the ornaments of accessories! They tie together the entire look, and these Harper Made tassel shorties have just the right amount of sparkle and fun. Pull these cuties out of your stocking and be thankful to have them just in time for that New Years Eve party! Speaking of New Years Eve Parties, you're definitely going to need to add this to your Christmas list! 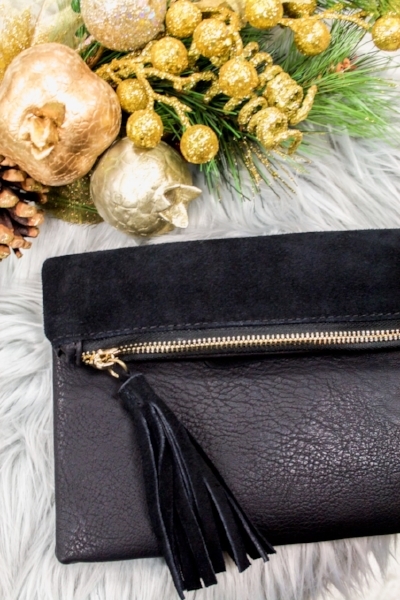 This beautiful black clutch is the perfect size for keeping up with your party essentials and will take your accessory game to a new level of style. An elegant choker is a simple, yet beautiful statement piece that can draw all of the right attention. Wear this sea foam blue choker to add a touch of color to complete your sophisticated Holiday attire! Add a little flare to how you do your hair! Who said that everyday items can't be stunning? 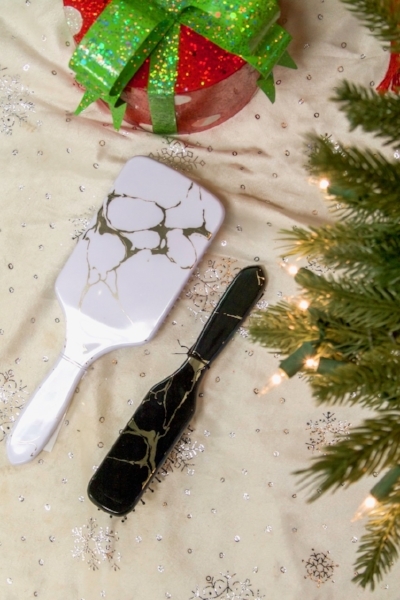 These marble designed hairbrushes are just as beautiful as they are useful and would look oh so gorgeous popping out of a Christmas stocking! Keep that hair going all day with the Paul Mitchel Invisible Wear Undone Texture Hairspray! Especially during the holidays, hair products can be the perfect small gift to stock up on. Come by the store to see what sort of bundles you can add to your Holiday list! There you have it! The perfect Christmas stocking for your favorite fashionista! December 25th will be here before you know it, so come by Blowtique so that we can assist you with all of your holiday shopping needs in any way possible! That's all for today lovelies! Once again, thank you for all of your love and support. We couldn't run the show without all of you! Have the most wonderful holiday season and don't forget to come by and see us!